"What a funny name for a town," Bonnie giggled. The two butterflies sat on a stone fence looking at a sign that read ‘Gretna Green’. "It doesn’t look any greener here than any other place in Scotland." "It’s just a name, Bonnie," Bruce replied. "Let’s have a look around and see what we can find to eat. I’m sure there’s a rose blooming somewhere around here." They fluttered off towards the town. "What’s that?" Bonnie asked. "It looks like an anvil," Bruce answered. They flew down and landed on it. "It’s cold and made of metal. It’s black and its shaped like an anvil." "What’s an anvil?" Bonnie asked. "Blacksmiths use it to pound out horseshoes and things. They get the steel or iron, or whatever other metals they use, really hot; so hot that its red and orange. They carry it over here and pound it with a huge hammer and make horseshoes, parts for plows, or whatever they need. This must be a blacksmith shop," Bruce replied. The butterflies looked at the building. "It doesn’t look like a blacksmith shop. What’s that sign doing at a blacksmith shop? It says that you can be married here. How odd!" Bonnie said. "It probably used to be a blacksmith’s place here. Oh, I remember now. This is Gretna Green. I know the story. Scotland didn’t have very strict rules on how old you had to be when you got married. In England, their rule was that if you were under 21 years old, you had to have your parent’s consent. So, many of the young English lads and lassies came up to Scotland to get married. Some of the parents weren’t too happy with that. Many of the father’s chased their daughters up here to try to stop them." "How funny. That must mean that Gretna Green is right at the border of England and Scotland," Bonnie realized. "That’s right. See those hills over there? That’s England!" Bruce told her. "Does that mean the blacksmith married them?" Bonnie asked. "Look around you, Bonnie. The blacksmith seems to be right in the middle of the village. Look at the roads that intersect here. It seems like a good place," Bruce guessed. Suddenly the door to the ‘blacksmith shop’ opened and a group of people came outside. "A bride and groom!" Bonnie said. "Oh, she’s very beautiful. Her wedding gown is so pretty and covered with lace and pearls. I think that they are going to get married here, right now. I think there is a wedding about to take place." The crowd gathered around the anvil. Bonnie and Bruce flew over to a tall sunflower, safely out of the way, and watched. "The groom looks nicely dressed in his kilt and black crushed velvet coat, doesn’t he?" Bruce said. "He looks very smart in his dress kilt. I’ve always loved weddings," Bonnie sighed. They watched as the ‘blacksmith’, or priest, performed the wedding ceremony right over the anvil. The bride and groom exchanged rings. "You may kiss the bride," the priest said. As the groom was kissing the bride, somebody released a hundred doves out of some cages near the anvil. "Watch out," Bruce cried. "Birds!" The butterflies flew under the huge petals and leaves of the sunflower and hid as the doves flew into the air. "There are so many of them!" "It must be part of the ceremony. Doves must be a romantic bird," Bonnie said. Someone in the group threw rice all over the bride and groom. One or two grains of rice hit Bruce and Bonnie. "Ouch!" Bonnie cried. "It’s not very safe here. First there were birds, now rice, and who knows what’s next. Let’s get out of here." Just as they flew into the air, the group below released hundreds of colored balloons. "Watch out!" Bruce called. It was too late. 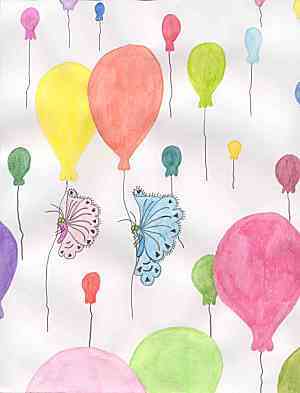 The balloons bumped into the butterflies. Bruce’s antenna bent over. Bonnie’s body got smashed between two of them. "Grab onto one of those strings!" Bruce urged. He reached out and caught one in his hands. He held onto tight. Bonnie grabbed the string of another balloon. As they soared upwards, Bonnie chuckled, "This is kind of fun. We’re flying, but don’t have to flap our wings." "It is sort of fun. Look at all the colors. There are blue, green, yellow, orange, pink, purple and red balloons, and there are so many of them. I wonder how high they’ll go?" Bruce said. "Up to the clouds, I hope. They are puffy, like balls of cotton. I’ve never been up that high before," Bonnie laughed. They looked down at Gretna Green. "It looks so small now. The bride and groom look like little dots. We’ll hang onto the strings of these balloons and see where we end up," Bruce smiled. Curious birds flew by, looking at the butterflies and the balloons as they floated through the air. They could see the rolling green hills pass below them. They floated over lochs, buildings, factories, and houses, wondering when and where they were going to land and begin a new adventure. Check out more on Gretna Green here!